Review of Calculations, Drawings, Temporary Supports, Erection Equipment, and Lifting. The new multi-phased, 27 km rail route will ultimately run southeast to west from Mill Woods to Lewis Farms crossing through Edmonton’s downtown core and will carry an estimated 100,000 daily commuters. The first phase of the Valley Line is the 13.1 km portion with 11 stops and one two-story station, which will run between Mill Woods and 102 Street, connecting commuters with the Capital Line and Metro Line at Churchill Station. 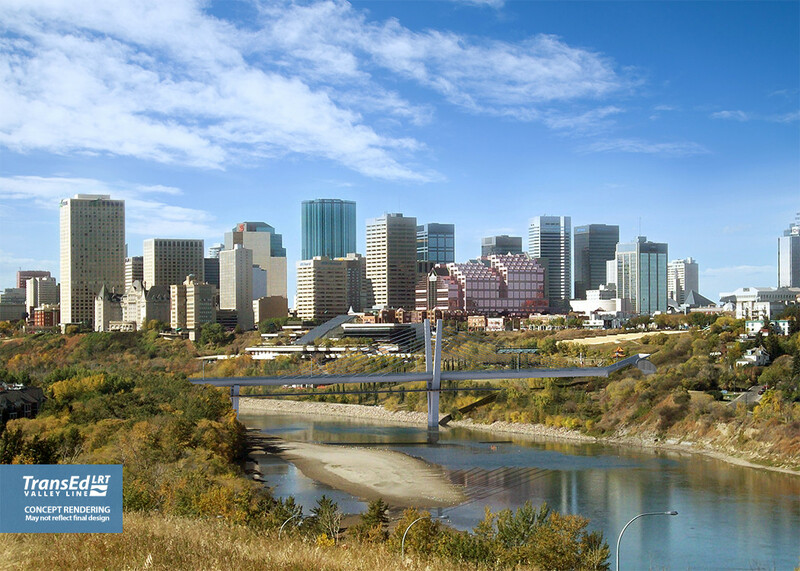 This phase includes the $391 million Tawatina Bridge, which spans the environmentally-sensitive North Saskatchewan River. The new rail bridge is a three-span (100 m, 110 m, 50 m) asymmetrical, extradosed bridge consisting of two lines of light rail transit. The superstructure is a multi-web box girder to be erected in balanced cantilever with form travelers (Pier 1; Span 1 and 2) and cast-in-place on falsework (Piers 2 and 3; Span 3). During the preliminary pre-bid phase FINLEY prepared the design modification to the superstructure as well as modifications to post-tensioning details including preliminary longitudinal & transverse design and analysis, pre-bid quantity estimates for superstructure & substructure concrete, reinforcing & post-tensioning, and recommendations for specialty equipment for construction & temporary works. FINLEY’s construction engineering services included integrated shop drawings review, review of calculations for construction analysis and camber; review of longitudinal and transverse post-tensioning layouts, details, and tendon elongations; review of calculations, drawings, temporary supports, erection equipment, and lifting; review of calculations and geometry control manual; design office support and on-site technical support.